The plantar fascia is a ligament located on the bottom of the foot (plantar surface). It runs from the heel to the toes and is made up of three seperate bands at the heel that become five bands at the toes. This ligament functions on the bottom of the foot as a support and is rarely injured in children. It is commonly injured, however, in adults and presents as a condition called Plantar Fasciitis. 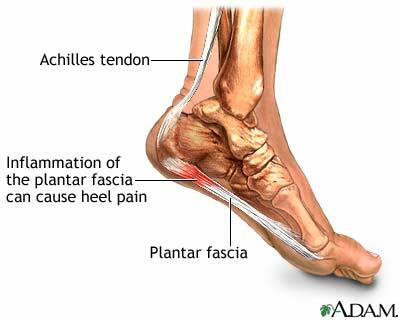 Plantar fasciitis is an inflammation of the plantar facia, a ligament on the bottom of the foot. It is usually caused by abnormal motion of the foot and can lead to severe pain to the heel with first step in the morning (post static dyskinesia) or after sitting for a period of time. This pain initially will resolve with some walking, but then returns as you go throughout the day. This injury can be further exacerbated by a tight Achilles tendon or by wearing poor shoes or going barefoot. 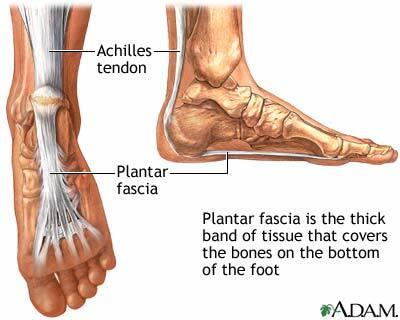 Although it is often felt shoes don't cause the problem, they may permit the initial injury that causes the plantar fascia to swell. Once swollen, the plantar fascia is relatively difficult to treat and usually doesn't resolve without some treatment. Treatment options vary from stretching of the Achilles tendon, ice massage, orthotics, night splints, cortisone shots, physical therapy and even surgery. Evaluation by a specialist in the foot and ankle can often allow you to be diagnosed with this condition while rullilng out other causes. An ultrasound of the plantar fascia may even be taken to ensure this truly is the problem. Although Plantar Fasciitis is a difficult problem, treatments do exist to improve and often resolve the problem. By the way, Heel Spur Syndrome is an old term utilized for this condition when heel spurs were thought to be the main cause of the problem. Heel spurs are no longer considered the main cause of the pain and do not need to be treated. Heel spurs are just a symptom of plantar fasciitis.